If I could condense all of the fantastic information and insight put into The Slave Next Door by Ron Soodalter and Kevin Bales into a training session, no one would ever leave without having a much greater understanding of the complexities of human trafficking, the wide profiles of victims and traffickers or the history and current status of the modern counter-trafficking movement in the U.S.
Bales and Soodalter tackle some of the most difficult issues embedded in the counter-trafficking movement with discernment and respect for the dozens of victims and field experts interviewed for the content. Topics such as prostitution, government and NGO relations, policy and legislation, the seeming pervasiveness of slave-made goods in a consumer culture, among many others receive balanced consideration and attention. 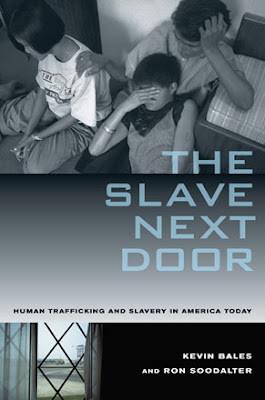 It takes a purposeful sensitivity to discuss these issues and do so without demonizing every element of our society that either at one point has or still is involved in modern day slavery; and yet this book is able to bring together a wide range of cases and arguments to provide the reader with constant stimulus to rethink what trafficking is and how we tackle it with a multi-sector approach. This includes the heroic actions of ordinary citizens in the past, and a detailed message about what people can do to take action now. Although the actions may seem a heavy burden, and any actions that individuals take should always be informed by what is already going on in the community, there is a lot to take away from the material in the action-oriented sections. This book will be a tremendous asset if you want to better understand human trafficking in the United States. Some, if not most of the information will shock you, particularly the stories of how people have been lured and exploited everywhere from the quiet suburbs to sleepy rural areas to busy city neighborhoods. Some, if not most of the information will force you to look inward and reflect on which societal and individual habits in the U.S. contribute to an environment conducive to trafficking. In the end, you will be more informed as a member of your local and international community, which, from my perspective, was the ultimate goal of the book. And please re-visit HTP today to catch an excerpt from The Slave Next Door!